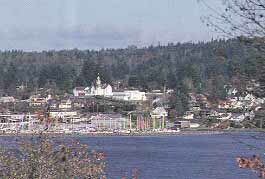 Poulsbo's name is derived from a Norwegian word meaning "Paul's place." Norwegians settled at the head of fjordlike Liberty Bay in 1882 and developed a fishing and farming community. The town is nicknamed "Little Norway". The highway east from Poulsbo connects to Bainbridge Island by a bridge, and then to Seattle by ferry. Poulsbo is part of the Bremerton, WA metro area.